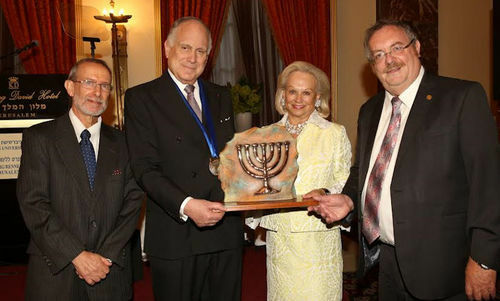 The Ingeborg Rennert Center for Jerusalem Studies of Israel’s Bar-Ilan University on Tuesday honored World Jewish Congress President Ronald S. Lauder with the prestigious Guardian of Zion Award for his efforts in the perpetuation and strengthening of Jerusalem. The WJC president expressed disappointment in the United Nations’ resolve at contending with these issues, saying international body was losing legitimacy as it allowed anti-Jewish sentiment to undermine it. Lauder also discussed the WJC’s efforts in combating attacks on Israel in the legal realm and on campuses, and proposed to enhance Jewish public relations efforts, “so that we, not our enemies will define who we are." He ended his speech with a plea: "This is the job before us now. We have to help our children and our grandchildren dust off their hearts, we have to help them re-discover that Jewish flame inside them. This isn't just important for Jews, it’s important for everyone, Jews and gentiles, because for over 5,000 years, that flame has been lighting the entire world." The Ingeborg Rennert Center for Jerusalem Studies was established at Bar-Ilan University in 1995 by US Jewish community leaders Ingeborg Hanna and Ira Leon Rennert as an expression of their heartfelt commitment to the preservation and advancement of Jerusalem's unique heritage. Integrating studies on the history, archaeology, geography, demography, economy and sociology of Jerusalem, the Rennert Center has become the foremost academic center in the international academic community studying aspects of Jerusalem's past and present. This is the 20th year the Rennert Center is conferring the Guardian of Zion Award. Last year's award was bestowed upon former US Senator Joe Lieberman. Additional recipients have included Jonathan Sacks, James S. Snyder, Dore Gold, Malcolm Hoenlein, Caroline Glick, Norman Podhoretz, Daniel Pipes, William Safire, Arthur Cohn, Charles Krauthammer, Cynthia Ozick, A.M. Rosenthal, Herman Wouk and Elie Wiesel.